Happy Birthday Escape Room Madness!! Most people define success as the amount of money a business or a person has, but for us, success is hearing our customers tell us they had a great time. We love to hear that our Escape Room challenged their minds and really tested their team-working skills. We enjoy seeing co-workers, friends, and families come to our facility and leave with a smile on their faces. It is the most rewarding when a group of strangers bond through the fun puzzles we’ve created. We feel accomplished when our ideas can bring joy to anyone who comes here looking to have a fun time! 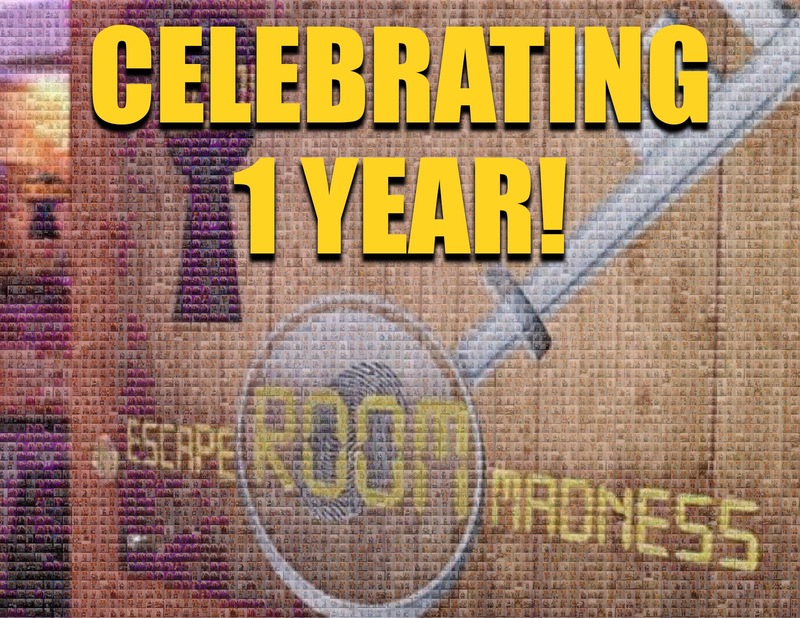 How did the idea of starting an Escape room business start? How long was it before the idea became a reality? It definitely took time. We didn’t want to just impulsively begin the business with just a list of ideas. It took several months of in-depth planning before we even began to look for locations. We had to figure out how many rooms we wanted, and we had notebooks full of planning that we went through before we were 100% ready to finalize a location. We got to a point where we had the idea for Apocalyptic Mission and Nuclear Annihilation, but The Perfect Crime was the first room that was fully complete and finalized. Then we went through the process of finding the location and starting to build the rooms. So, it definitely took time before it became a reality. We have plenty of funny stories about the renovation of the rooms. What are some of the funny things that happened while you were trying to get the business started? It was really funny when we had to replace the floors in the rooms because we didn’t want carpet. We got a machine to remove it, but we didn’t realize that it created a lot of smoke. The place would be engulfed in smoke while we were using the machine, and after a long day of being in that smoke your clothes are all greyed up, and so are your eyebrows and hair. We would look at each other and burst into laughter at how crazy we looked! One night we had to take a subway home and people were just looking at us because we looked like we crawled out of a construction site. We also had good laughs while making puzzles. There was a lot of “You think someone is gonna get out of this room? It’s gonna take them two years to get out!” when a new puzzle was presented. Then, the idea for that puzzle would become so outlandish that someone would ask “How are we gonna do that?” and the answer would be, “I don’t know, somehow” followed with laughter. Do you remember your first customers? What was it like running that game? Yes! It was a grandmother and her granddaughter. The granddaughter was so excited and happy. She kept saying “ Grandma can we do it, please!? It’s gonna be so fun, please please!” They played The Perfect Crime. We were nervous because it’s a different perspective when it’s someone who has no idea what they are walking into versus the designers of the room. We didn’t know how they would react and we were eager to see what their feedback would be. We also got a chance to see what it was like to be on the other side as clue masters. They really enjoyed the game and it was a great feeling to have played our first game. How has the business developed in this first year of service? We have come really far from where we started. We started with a lot of knowledge, but it doesn’t compare to the amount of knowledge we possess now. We’ve learned so much about what will interest people and have continued to make extraordinary renovations to our rooms. We have built a lot of clientele and have been given great reviews. Our team has grown and is dedicated to providing the best customer service and experience possible. We knew that the business would develop, but we definitely didn’t know that we would be as successful as we are now. And we are still growing and developing! The work doesn’t end. We are always working on new ideas and finding other ways to better our business. Why should people choose Escape Room Madness? The Escape Room Madness team believes in creating a unique team-building experience between co-workers, families, friends, and even strangers. We always ask our customers for feedback and modify our Escape Rooms in order to provide the best experience. Our employees are very engaged and excited to share the experience with the customers by sending them clues throughout the game and monitoring them closely. We believe in giving our players our undivided attention during games which creates a personal environment for each game. We have been around for just one year but we have seen a huge number of returning customers. Our customers always leave remembering the name of their clue master. We continuously aim to make your Escape Room experience memorable! We hope to eventually open up new locations both in New York and other states. Right now we are going to continue to provide extraordinary service and keep the reputation we have while building clientele.